Family Fundraising Party for Kusi Kawsay School in Pisac, Peru! 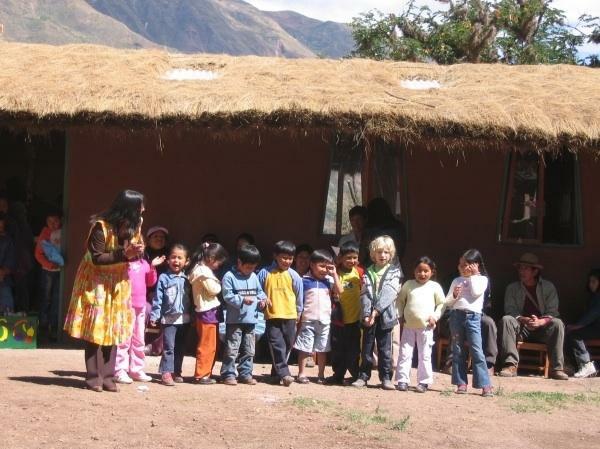 KUSI KAWSAY is a Waldorf-Inspired School rooted in local Andean traditions. The school offers an alternative, integral education that relies on donations to make it very affordable for the economically challenged population of the area. Help us have fun and raise money for Kusi Kawsay School to build 3 more classrooms! *Watch a slide show of our trip! *Sample Peruvian inspired food and drink! *Support the school and shop for the holidays by purchasing local crafts from the region! *Make a tax deductible donation to support the school! Click here to see the school construction video. "Our family had an amazing experience living and studying in Peru earlier this year, and we wish to share with you our enthusiasm for Pisac, the community where we lived, where Sage and River attended school, and where we purchased land. You may have heard us describe the people, culture, and dramatic landscape of the Sacred Valley of the Incas where Pisac sits at the base of massive Incas terraces. The area is inspiring in every sense of the word: breathtaking mountain vistas, living cultural and linguistic traditions, community celebrations, and rich agricultural bio-diversity (that Steve researches and teaches about). We are especially impressed by our new friends, a group of local families in Pisac that recently built a wonderful new school based on a positive and transformative vision for their children and their community. This school, Kusi Kawsay, which means �Happy Life� in the Quechua language is giving local children an inspiring education, and it gave River and Sage a window into Andean culture and many new friends. We are dedicated to supporting Kusi Kawsay School so that it may grow and continue to provide an exceptional education to children that don�t have the privileges we are blessed with. We would like you to think globally, and consider joining us to support River and Sage�s wonderful Peruvian School, Kusi Kawsay." "KUSI KAWSAY School values and promotes Andean traditional culture while keeping an eye to the outer world through a curriculum that integrates the arts, sciences, math, geography and language instruction in Spanish, Quechua, and English. Kusi Kawsay is dedicated to providing equal opportunities for girls and boys alike, and supports each student to develop strong self-esteem and a dignified sense of cultural identity. Creative problem solving and decision making skills are emphasized to help develop student leadership abilities so that they may fully participate in a diverse society and changing world. Kusi Kawsay was recently named part of the network of UNESCO schools dedicated to work in support of international understanding, peace, intercultural dialogue, sustainable development, and quality education in practice. "As an independent new school, Kusi Kawsay is still in its building phase, and is dependent on outside sources for many costs, including construction. We recently heard from Kusi Kawsay that the Peruvian Ministry of Education (which licenses independent schools) has suddenly expanded the development requirements for the new school for the coming year. The school must add 3 more classrooms by March 2011! The school association has accelerated their capital campaign and must raise ,000 by March to complete this phase of their construction. "We know that the school doesn�t have a list of big donors, and is relying on people like us to do everything we can. Our family is pledging 2% of our gross income towards this effort. We are returning to Peru this summer and will be actively involved in this community and school for years to come. We invite you to share in our efforts to keep Kusi Kawsay an inspiring place to study and build community. "Please consider making a gift of lasting value by donating to the Kusi Kawsay School this holiday season! "Feel free to contact us as well. We look forward to connecting with you, sharing more stories, and answering your questions." 5139 25th Lane NW Olympia, WA.